Unrequited Love and the Beauty of the Beloved: Literary and visual themes in a 17th century manuscript of the Divan of Baki. This talk will explore the relationship between the miniatures in the Divan of Baki and its text to analyse these themes and place them in the context of the Safavid illustrated manuscripts of the seventeenth century. The anthology of the Ottoman court poet Mahmud Abdülbaki (pen name Baki) was copied numerously and illustrated several times. 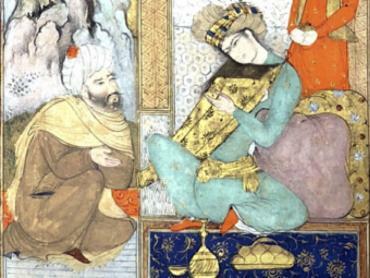 However, only one of these illustrated manuscripts brings together his Ottoman Turkish poetry with Safavid paintings. Dated 1636, this luxuriously decorated manuscript of Divan of Baki, today in the British Library, features eight Isfahan-style miniatures.The connection between the text and the images is one that reflects the well-established tradition of the illustration of non-narrative books in Safavid Iran, and there is an analogy between each image and the poem immediately next to it in terms of themes such as unrequited love and the beauty of the beloved. Özlem Yıldız holds an MA in History of Art and Architecture of the Islamic Middle East at SOAS, University of London, and an MA in Ottoman History at Sabancı University, İstanbul. Her main area of interest is Ottoman and Safavid illustrated manuscripts from the sixteenth and seventeenth centuries. She is one of the recipients of a 2017-2018 The Barakat Trust Scholarship.